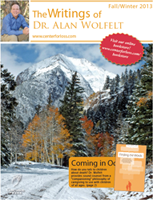 Dr. Alan Wolfelt, founded the Center for Loss more than 20 years ago to compassionately support both mourners, by walking with them in their unique life journeys, and professional and lay caregivers, by serving as an educational resource and professional forum. Dr. Wolfelt’s model of “companioning” versus “treating” people in grief is respected the world over. He presents numerous workshops each year throughout the United States and Canada for hospices, schools, universities, funeral homes, community groups and a variety of other organizations. He offers 4-Day Trainings for bereavement caregivers here in Fort Collins, Colorado, as well.